Zip (also known as Gash in Grand Theft Auto: Vice City) is a recurring clothing chain first introduced in Grand Theft Auto III, serving as a spoof of Gap. Whilst most of its depictions in the series are cosmetic, Zip serves as an interactive clothing chain in Grand Theft Auto: San Andreas. The Zip brand is commonly associated with consumerism in the series, prominently featured in both Grand Theft Auto III and Grand Theft Auto: Liberty City Stories on shopping bags carried by certain pedestrians in the commercial districts of Newport and Belleville Park in Staunton Island, Liberty City; Zip boxes may also be found in the rear compartment of certain Landstalkers, implying the vehicle is used to transport excessive amount of purchased Zip merchandise. A Zip customer roaming the streets of Staunton Island, GTA III. A Zip shop in Belleville Park, Staunton, GTA III. Green version of the Zip logo in GTA Liberty City Stories. In Grand Theft Auto: Vice City, the Zip brand is replaced by Gash, which shares the same logo design as Zip; however, Zip logos are visible on certain vans and Hotring Racers in the game. The game also features a two-storey Gash outlet at the North Point Mall in Vice Point, Vice City, which prominently features a "Casual" clothing pickup (a simple outfit consisting of jeans and a T-shirt) in front of the second floor entrance, and is also incorporated into the mission "Shakedown" as one of the outlets the player is required to intimidate for protection money; in Grand Theft Auto: Vice City Stories, the Gash outlet has yet to open circa 1984 as renovation works on the store is either underway or has yet to begun. The Gash brand is also promoted on a blimp that floats hundreds of feet above Downtown Vice City. North Point Mall's Gash store, GTA Vice City. Two differing logos of Gash in GTA Vice City. Three different ads for Gash as seen in the North Point Mall, GTA Vice City. 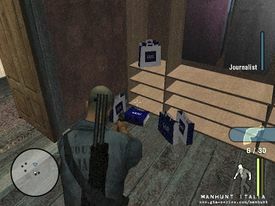 Gash shopping bags in the Vercetti Estate, GTA Vice City. Side view of the Gash blimp that hovers above Downtown Vice City, GTA Vice City. A Benson bearing the Zip logo, GTA Vice City. A Gash billboard in front of the Cherry Popper Ice Cream Factory, Little Havana, GTA Vice City. The Pilgrim strip mall, Las Venturas. Logo of Zip in GTA San Andreas. The logo is more reminiscent to that of Gap. Shared interior of all Zip clothing outlets, GTA San Andreas. A future Zip outlet in King's, San Fierro, GTA San Andreas. A trailer with the Zip logo, GTA San Andreas. In addition, an eight storey building in King's, San Fierro, features scaffolfing with banners that sport the Zip logo and an announcement that the building would house a Zip outlet ("New Store Open Soon - Six More Floors of Khakis"; the end of "Khakis" is partially obscured by paint, appearing to read "Khak"). The player in Manhunt aiming their gun at Gash bags similar to those found in GTA Vice City. Gash is one of several fictional brands from the GTA series that is featured in Manhunt, another Rockstar North game. Specifically, Gash bags can be found in the Reporter's Apartment in Carcer City. Clothing on offer from Zip primarily consist of mid-range casualwear that are not primarily suited for use among gang members, as nearly all of the clothing lack the green gang colors of the Grove Street Families, as opposed to those found in Binco and Sub Urban. However, a few generic clothing from Zip (T-shirts and hoodies) are in fact recolors of clothing seen in other stores, and Zip is also the only clothing store that offers rugged street or hiking boots. For a comprehensive list of clothing available from Zip in GTA San Andreas, see /Clothing in GTA San Andreas. This page was last modified on 12 March 2017, at 15:17.